Doctor Ung Thi Hoai Yen joined Cao Thang Eye hospital in early year 2018 as an ophthalmologist in Comprehensive & Imaging department. Previously, Dr. Hoai Yen worked at Ophthalmology department of District 10 General hospital, HCM city from 1986 to 1989; Nhan Dan Gia Dinh hospital between 1989 and 2010 and An Khang General Clinic from 2010 to 2018. 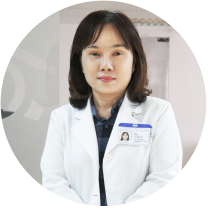 Dr. Hoai Yen attained Medical doctor degree in Fundamentals and Principals ophthalmology in 1985 and Specialist Level 1 (equivalent to Master in Ophthalmology) in 1992 from the Ho Chi Minh city University of Medicine and Pharmacy, Vietnam. She also received a Postdoctoral Level 2 in Ophthalmology from the same institution with the thesis “Assess the thickness of macular by B scan ultrasound compared with OCT” in 2006. Dr. Hoai Yen was a co-author of the scientific study for hospital with the topic “Assess the outcomes of pterygium surgery with conjunctival graft”. And she received the Merit Certificate for participating into cataract surgery for the poor people sponsored by Ho Chi Minh city Sponsoring Association for Poor Patients which was awarded by City Committee of Party.